Repeat Performance offers high quality, cost-effective office furniture workstation solutions by utilizing “AS IS” and remanufactured Steelcase pre-owned systems furniture inventories. Please visit www.repeatperformancesolutions.com to view a full-site of all products, services and finishes available. AS IS: We carefully locate, warehouse and sell high quality Steelcase pre-owned inventories. Blending: Successful projects are a collaboration of ideas and products. With our solutions you can blend new and used to achieve brand image, maximize value and function. Rental: Add capacity to your office without investing in a big dollar purchase. Panel Re-upholstering: All furniture regardless of the manufacturer can be outfitted with new fabric. Custom: We provide solutions to your specifications. You choose the fabric, paint color and laminate. Unlimited design options. Painting: We operate a controlled painting facility to give fresh appearances to outdated finished parts. Sustainability…Putting workstations back to work. Why dispose of products that have many years of useful life left? 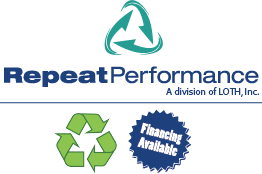 At Repeat Performance we keep roughly 150 semi-trucks of office furniture out of landfills each year. Remanufactured solutions not only save you money, but help the environment too! Send us your layout and allow Repeat Performance the opportunity to provide a solution.